Eagles did well last year with a skilled crop of underclassmen - but this year, the team aims to be even better. Apple Valley head boys' hockey coach Jerry Hayes cringes when people talk about last season's "success." "When you're on the biggest stage at the state tournament, and you're there, people automatically assume you were a successful team," said Hayes, who was named Class 2A Coach of the Year by the Minnesota Hockey Coaches Association after leading the Eagles to their first state tournament since 1996. "We need to be better." The Eagles trudged through the regular season with a 14-11-0 record before getting healthy and hot through sections with wins over Eagan, Woodbury and a big upset over Blaine in the Class 2A state quarterfinals. The good news for Hayes and Apple Valley fans is that last season was largely a product of youth. The program's sophomore class and breakout freshman Hudson Fasching contributed 146 of the team's 265 total points. Hayes, entering his 13th season at Apple Valley, credited former head coach Pat Westrum for building the youth programs 10 years ago. Westrum co-head coached with Larry Hendrickson for the Eagles' 1996 state championship and spent a lot of time getting kids on the ice. "We have a big bubble of kids in that particular age group -- our junior class and sophomore class. We have a lot more hockey players in that age group. The result is some 15- and 16-year-olds who are pretty skilled hockey players," Hayes said. "The years preceding them, we didn't have as many kids playing hockey, so you have kind of a shallower pool. But I think if you look at a lot of the programs in the [Class 2A] world, numbers is a big part of team successes." Key members of this talented crop include Fasching, now a sophomore, who exploded onto the scene last season with 25 goals and 18 assists for 43 points. Junior A.J. 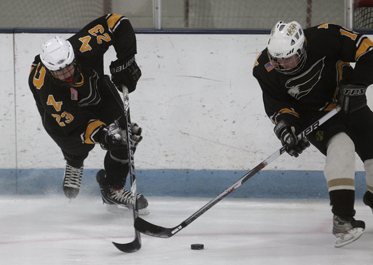 Michaelson, who recently committed to play at the University of Minnesota, scored 18 goals and had 16 assists for 34 points despite missing eight games because of an injury. Players such as Fasching and Michaelson can create opportunities out of thin air, but the Eagles' young defensemen have stabilized the back end and put up their fair share of points, as well. Derek Smith is one of those guys. Considered one of the Eagles' under-the-radar players, this stay-at-home defenseman produced 17 points in his sophomore season, helping move the puck up to guys like Fasching and Michaelson. "They're great players and fun to play with," Smith said. "Every time they get on the ice, they're a threat to score." This will be Smith's third season at the varsity level. Hayes throws him out there against other teams' top lines because of his decision-making and ability to neutralize the opponent's offensive attack. Smith admits the game has slowed down for him a bit, "but there are some real good players out there." He'll be helped by puck-moving blueliners Anthony Leong and offensive specialist Vince Pedrie's booming shot. Captains Michael Berens and Kris Goodman lead the senior scoring attack and goaltender Aaron Gretz, who has accepted a baseball scholarship to Ohio State, will be the go-to guy in net. "It starts with him," Hayes said of Smith. "I think he's kind of the anchor back there and probably the guy that we trust the most, defensively."